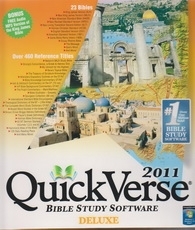 QuickVerse Deluxe contains 23 of the most popular Bible translations and over 460 reference works to provide you the most complete in-depth Biblical research product on the market. Commentaries, Bbile dictionaries, maps and devotionals are just a sample of the references that will be at your finger tips to make your experience informative and enjoyable . . . Each feature has been carefully developed to be very sophisticated, yet easy to use.